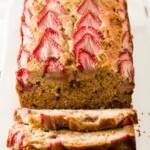 Strawberry banana bread is a fun variation on banana bread! It's moist and flavorful and looks so pretty! 6 strawberries Slice vertically into about 6 slices per strawberry. The bread looks best if you snack on the really small slices and only use the larger ones. In the bowl of an electric mixer, cream butter and white and brown sugars until light and fluffy, about three minutes. Mix in eggs, sour cream, and vanilla until fully combined. Mix in flour and baking soda a little bit at a time until just combined. Fold in chopped strawberries with a spatula until evenly distributed in the batter. Transfer batter to a greased 9.25 x 5.25 inch loaf pan. Use the sliced strawberries to decorate the top of the loaf, placing them flat on top of the cake in rows of four going down the entire loaf. Place the loaf pan on the center rack of your oven. After 60 minutes, check to see if the top of the cake looks like it is getting to be a dark brown. If so, to prevent burning, cover the banana bread loosely with foil. Continue to bake for another ten minutes and test for doneness. If it's done, a skewer inserted into the center of the loaf will come out clean. If the skewer has crumbs on it, continue to bake, checking every five minutes for doneness. Let the strawberry banana bread sit in the loaf pan on top of a cooling rack for ten minutes, then turn out onto the cooling rack. Use very ripe bananas. The riper the banana, the sweeter the end result will be. Be careful not to overmix the batter. Overmixed cakes can become gummy. The end pieces of the bread will always be a little more dry than the center pieces. Keep that in mind when serving the bread to guests. You can replace the sour cream with yogurt or Greek yogurt and not notice any difference at all. If your pan is a different size than mine, watch the bake time closely as a smaller pan filled higher may take longer to bake.